… are specially selected for re-enactors. They are soft, comfortable, durable, and stretch with use Any minor blemishes can be patched or incorporated into the design of the historical garment. Deerskin is sold by the whole hide, but priced by the square foot. Average size is 7 to 12 square feet. You can gain 10% to 15% square footage by soaking and stretching hides prior to use. 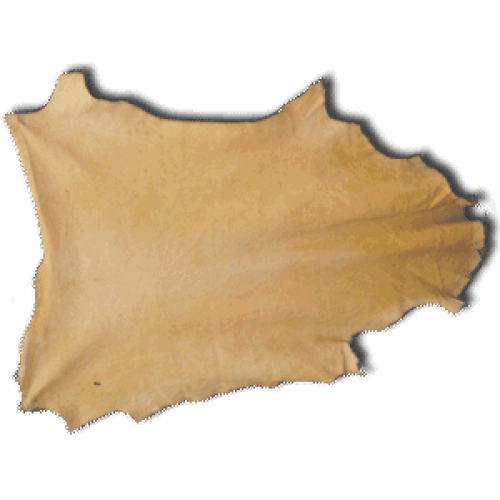 Deerskin has been commercially tanned in America since the 1700's. Only brain-tanned deer has the top-grain removed and is suede on both sides. Most re-enactors use top-grain tanned deerskin because it is much less expensive and is more durable than brain-tanned. The average deerskin is 7 - 12 sq. ft. in size. We can help you choose the correct sized skins when you call to order. Colors: Saddle, Black, Bone, Gold, Acorn, Cream, Willow ($3.50 sq. ft.), White ($5.25 sq. ft. Limited), Commercial Brain Tan ($5.50). All are 2- 3 oz. Leggings - 2 hides, each 9 sq. ft.
War Shirt - 2 hides, 11 sq. ft. each, plus 1 hide 10 sq. ft. Pants - 30 sq. ft. Dress - 2 hides at 11 sq. ft, plus 1 hide at 10 sq. ft. Shirt - 2 hides at 11 sq. ft.